BFREE works to promote and facilitate permitted scientific research in the Bladen Nature Reserve and other neighboring protected areas. Early scientific exploration in the upper Bladen watershed generally was descriptive, short-term, and restricted to the dry season. Since the establishment of the BFREE field station, researchers have year-round access to remote and undisturbed research sites. Biological inventories for several taxa exist, and a number of long-term and quantitative studies have been undertaken. 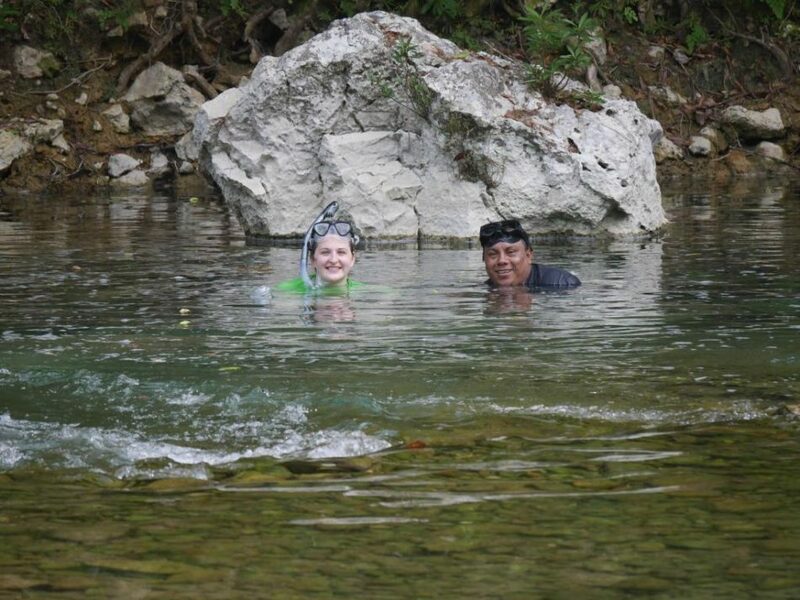 Emily Buege and Melito Bustamante during Buege’s cichlid study. We offer basic, comfortable living and research facilities and access to a diverse array of potential study sites. Also, BFREE maintains a number of scientific resources, including the Rainforest Lab, the Dora Weyer Natural History Library, reference biological collections, equipment, and daily onsite weather measurements since 1997. This lab, completed in 2011, was a joint effort between BFREE and Lincoln Memorial University. The lab provides a work space and specimen storage area for visiting researchers and students and is equipped with microscopes, a refrigerator, as well as other essentials. All researchers must review and sign the Lab Use Agreement prior to their arrival at BFREE. For information about completing research at BFREE contact Jacob Marlin at jmarlin@bfreebz.org. BFREE stores a hodgepodge of basic research and mechanical equipment that may be borrowed or rented by visiting students and researchers, depending on the intended use and duration. In general, if a piece of equipment is crucial to your research, you should count on bringing your own. Bring two, for that matter, and consider making a material donation to BFREE when your research is inactive or concluded!